Made of Polished red Aberdeen? Granite, erected in 1872, originally it would have had a water spout made of brass. 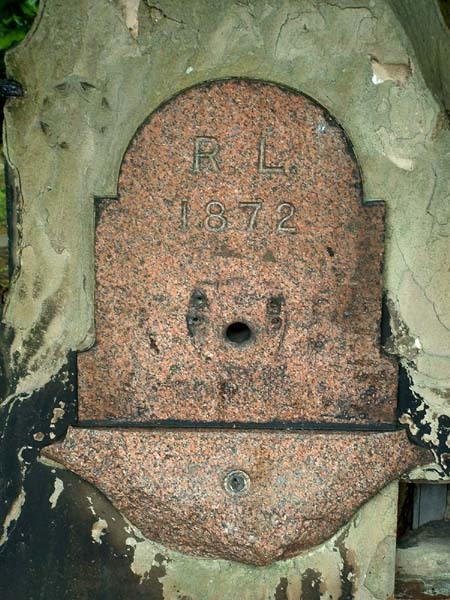 The initials R. L. stand for Robert Leicester a well respected incumbent of St Peter's Church, Woolton, who donated the fountain to the people of Woolton. Ron Brown of Woolton, gave the information about the the initials R. L.
The building was consecrated on September 16th 1826 by Bishop William Jacobson of Chester, and given a district in 1828, which was placed under the charge of the Revd. 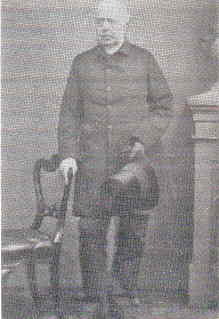 Robert Leicester, M.A., who remained responsible for forty-nine years. He died in office in 1875. His house, 'The Parsonage', built in 1831, is still standing in Church Road, and is now called 'Churchfield'. His benefactions to the village included the large lamp at the junction of Allerton Road and Woolton Street, and the drinking fountain by Lodes Pond. He was instrumental in having the school extended by the erection of a new building in Church Road South for the use of girls and infants (1848). The boys then moved from School Lane to the building opposite the Church, dated 1823, where the girls had previously been housed. In 1863 the district of Woolton ceased to be a chapel of Childwall and the two were separated. In 1868, by the appropriation of certain great tithes, the benefice conferred upon its incumbent the title of Rector. The Vicar of Childwall continued to be the patron of the living. There are several memorials to Robert Leicester and his family in and around the present church. The windows in the chancel are dedicated to his memory and that of his wife. The baptistry window commemorates his death, and a memorial on the north wall, also from the old church, is in memory of Robert Leicester's mother. There is a large family grave and a memorial to the last surviving daughters. At the time of his death several members of his large family were involved in good works in the parish. Good works by the Leicester family, and the second Rector, the Revd. Edward James Bower, M.A. (1875-1886) often meant the relief of the poor. Many of these were of Irish extraction, forced to leave their homeland by the potato famine of 1847, who lived in some squalor in the area of Quarry, Rose and Rodick Streets. Many of the native population were little better off and their living conditions provided a breeding ground for all kinds of epidemics. The '70s and '80s brought a series of severe winters, which were locally referred to as 'long frosts', and caused high unemployment in what was still an agricultural community. The clergy and gentry of all the neighbourhood churches united to organise a soup kitchen in the Mechanics' Institute, as well as the distribution of coal to a population, which was on the verge of starvation. In 1871 alone, over one hundred people (mostly the old and very young) were buried in St. Peter's churchyard.